And so continues my lifelong quest to rid the world of baking mixes. You can go to the store and buy some sort of blueberry muffin mix for a few bucks and it will contain strange little freeze-dried blueberries. The mix certainly will not be packed with lovely, fresh blueberries that melt into the muffins as they bake. The mix certainly will contain a lot of cheap ingredients instead of using real maple syrup as a sweetener. The mix will certainly not be that much faster to actually make than if you just made it from scratch. It’s the difference between mixing together four things or eight things. 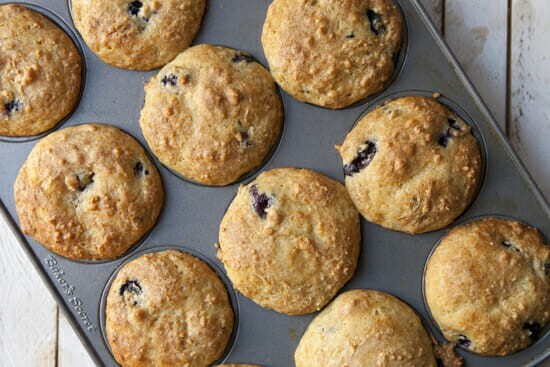 Oh, and these Maple Blueberry Muffins are just plain better. 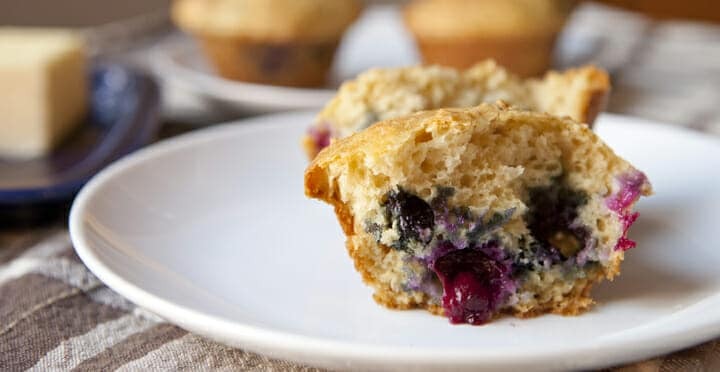 These tender and flavorful homemade muffins are packed with fresh blueberries and sweetened with natural maple syrup. 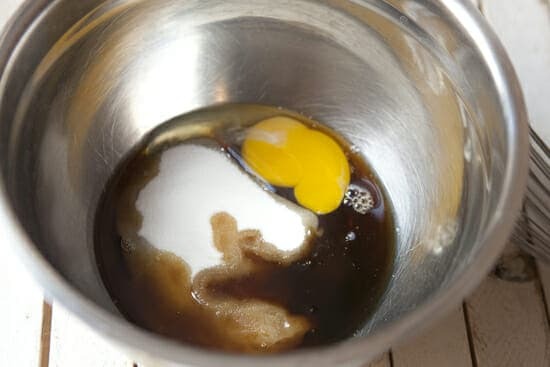 1) Preheat oven to 350 degrees F. In a medium bowl whisk together egg, sugar, syrup, yogurt, melted (and cooled) butter, and milk. Set aside. 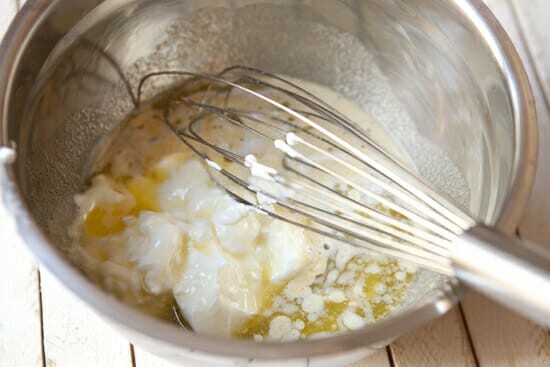 2) In a larger bowl, whisk together dry ingredients. Wash blueberries and toss in with dry ingredients. 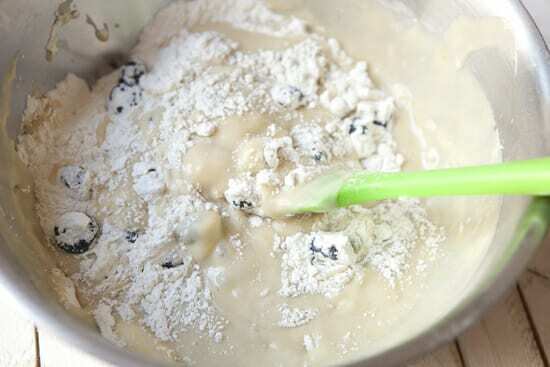 3) Add wet mixture to the dry mixture and fold the batter together. If it’s very thick add a bit more milk. 4) Divide muffin batter between 12 muffin tins that have been lightly buttered or oiled. 5) Bake muffins for 25-28 minutes at 350 degrees F. Rotate the muffin pan once halfway through cooking. 6) Remove muffins when they are golden brown on top and around edges. Let cool in pan for a few minutes and then remove and eat while warm or let cool completely and store in an airtight container. The nice thing about learning to make a decent muffin is that once you get the basic batter down you can add in pretty much anything and start substituting. Sweetener substitutions are always fun. Instead of all sugar, I subbed half of the sugar in my standard recipe for maple syrup. Please try to use real maple syrup. 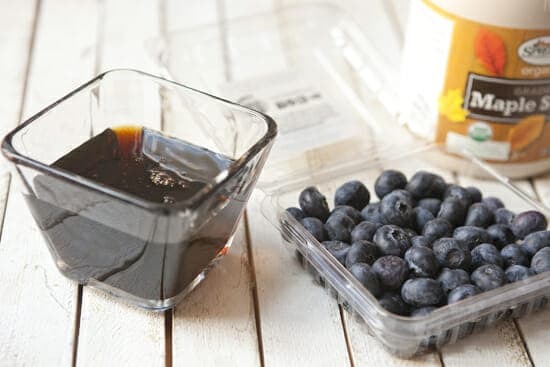 If you use the cheap stuff then you are essentially substituting sugar for high fructose corn syrup which is probably not worth opening another container. But the real stuff is worth it. I think you could actually substitute all of the sugar for maple syrup but if you do that you probably won’t need the milk and also your muffins will be an expensive batch of muffins because real maple syrup ain’t cheap. 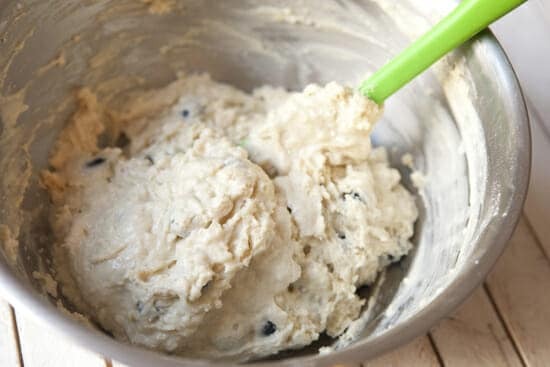 To start the Maple Blueberry Muffins batter, whisk together all the wet stuff and the sugar. I recommend starting with the egg, sugar, and syrup and whisk that together until the sugar is dissolved. Then you can add in the butter (melted and cooled), yogurt, and milk. 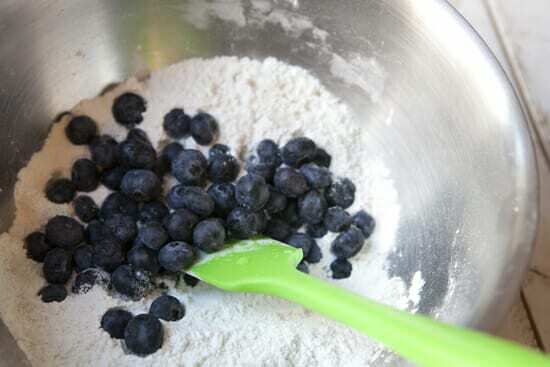 Meanwhile, in a large bowl, whisk together the dry ingredients and then toss in your washed blueberries. Toss those so they get coated lightly with the dry stuff. Now add your wet ingredients, but try not to over-stir the mixture. Just gently fold everything together. You should end up with a pretty thick batter. If it’s super thick (like cookie dough thick) add more milk so it relaxes a bit. 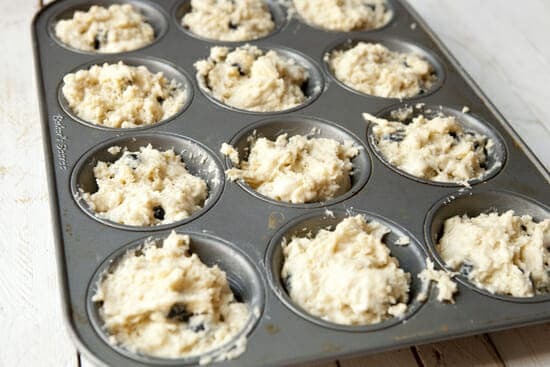 Scoop the batter into 12 muffin tins. You should need to use paper liners if you lightly butter or oil the tin, but you can if you want. You can fill the tins pretty full. You want the muffins to puff up over the tops of the tin. 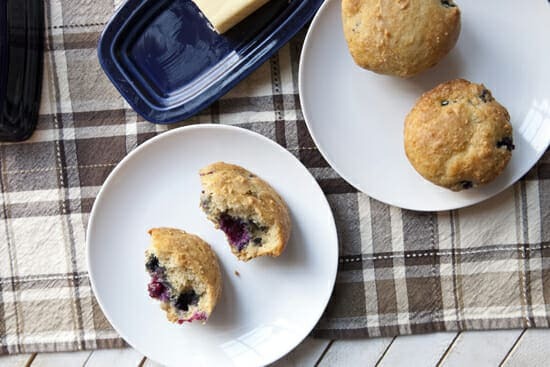 Bake these Maple Blueberry Muffins at 350 degrees for 25 minutes and rotate the pan halfway through so they cook evenly. Once the muffins come out, let them cool for a few minutes and then you can take them out of the pan and serve them while warm or let them cool completely and store them in an airtight container. These Maple Blueberry Muffins are so delicious when they are a bit warm, but I also thought they were good the next day. An extra bit of butter never hurts either. I agree 100% with your rant. I finally convinced my wife that NOT using a strange box mix is so much better in every way. She is on board and is even convincing her other non-cookers that homemade is the way to go. I have been saying I don’t want my muffins, cake, or whatever tasting like cardboard so I just mix a few more (better) ingredients together. I was wondering what I was going to make tomorrow after work- now I know! Providence has already placed two containers of fresh blueberries in my refrigerator- this was a match meant to be. We gave up the following: processed foods, pesticides, additives, plastic containers, and GMO’s ( we shop at Trader Joe’s). We added juicing. It doesn’t take any more time to make it from scratch and it TASTES SO MUCH BETTER. Finally made these this morning (yes, before work) as a healthy breakfast before my daughter’s Advanced Placement test. I figure the Greek yogurt qualifies as a healthy protein source. They came out a great texture, not crumbly. Thanks for your great recipes.